A post by Christopher A. Tarango, a Cornell grad student in ornithology and a fungus fan. 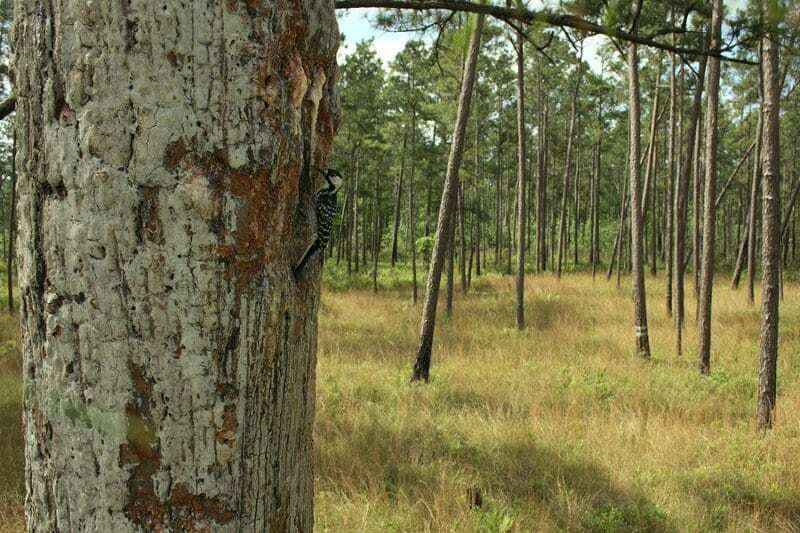 Many woodpeckers live in dead trees, but the Red-cockaded Woodpecker (Picoides borealis, RCWO) makes its home—with help from a fungus—only in living pines. In the southeastern US, family clans of RCWOs build and defend a set of excavations in pines known as a cavity cluster. Some cavities have been thoroughly excavated; others barely started. A cavity cluster includes excavations ranging from small indents to fully decked-out resin-defended nesting fortresses. Because RCWOs put in the effort to build homes in the strong living wood of a pine tree, they’re able to live in the same excavations for years. For defense against tree climbing snakes, they make and tend small cuts called resin wells, stimulating the trees to produce a sticky, snake-proof barrier. 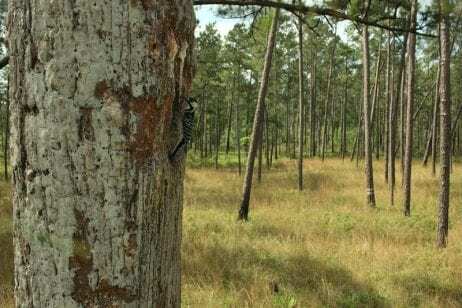 Unfortunately, reliance on live trees has also proven to be this woodpecker’s downfall; human impacts, including logging and fire suppression, mean their ideal trees are rare. RCWOs need perfect “goldilocks” trees to flourish. These “just right” pines must be old and sturdy enough to support a cavity at the perfect height, yet not too old and overgrown that they hide predators. Their reliance on old-growth pine forests, now rare due to extensive logging, has left them federally endangered and teetering on the edge of extinction. But, in a conservation success, efforts to protect RCWOs have been fruitful. Relatively early recognition of their “goldilocks” needs led to measures protecting vital swaths of forest. In addition, fire management in key areas has helped keep the forest understory cleared and RCWO friendly. This isn’t just good news for RCWOs—a host of other species rely on their cavities as well. When RCWOs move to a newer excavation in their cavity cluster, their abandoned holes are quickly occupied by birds and other critters who lack the energy or skill necessary to dig into a live tree themselves. This makes the RCWO a “keystone species,” like the wolves of Yellowstone or the sea otters of California’s kelp forests. But why are these woodpeckers so adept at making holes in live trees? And why don’t all woodpeckers do that? That’s where our fungus friend enters the story. Porodaedalea pini (=Phellinus pini) is a conk fungus that attacks the soft inner heartwood of conifers, causing a disease called Red Ring Rot or Red Heart. Spores can infect living trees via wounds and branch stubs, and the mycelium of this fungus grows in the wood, weakening the trees, and leaving them alive but worthless for commercial harvest. But where humans see a problem, the crafty RCWO finds opportunity. By targeting infected trees, RCWOs don’t need as much effort to carve out a cavity. But how do they know which trees are affected? As it turns out, the RCWO, like many birds, can see beyond human vision, into the ultra-violet spectrum. A clever experimenter with a spectrophotometer found that wood infected with P. pini is visually distinct to the eyes of a RCWO—they can see the infection even when there are no conks. But RCWOs are very particular about where they place their nests. And despite being massively damaging to the lumber industry, P. pini is actually relatively rare in young trees. Even in the trees it does infect, it may not infect the most desirable spot for a RCWO cavity. So, do RCWOs wait patiently for P. pini to pop up in just the right spot? It seems like the answer may be no. Using DNA sampling to test the bodies of RCWOs as well as their cavities for fungi, scientists linked the fungal community on RCWOs to their excavations. They also found that similar excavations made by humans with RCWOs excluded did not have the same fungal communities. This seems to indicate that the birds are behaving in ways that help spread P. pini from tree to tree. By starting a small hole, RCWOs can inoculate a tree and wait for P. pini to work its magic. Then they excavate a little more, rinse and repeat. This relationship apparently also benefits P. pini by helping it spread from tree to tree. If you were a spore, wouldn’t you rather get placed directly onto a perfect wound in a tree, than drift aimlessly on the wind hoping to land in the right place? Could the key to saving a rare bird be understanding its strange relationship with a fungus? Fostering this bird-fungus mutualism and finding a balance for timber companies and RCWOs may just make the difference in this bird’s fight for survival. This isn’t the only story of a woodpecker and a fungus. 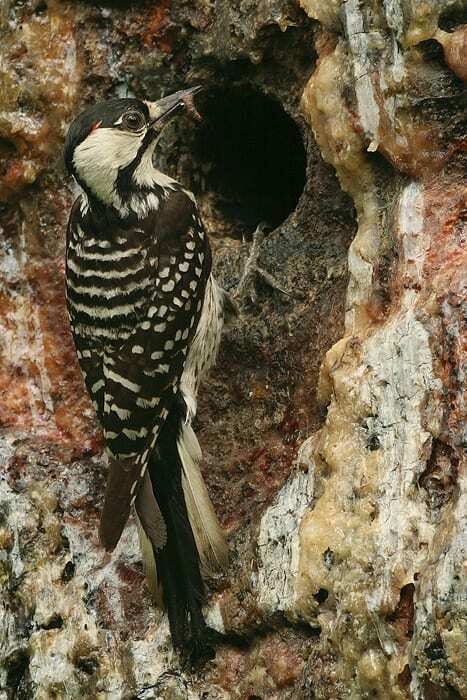 In the western United States, the White-headed Woodpecker (Picoides albolarvatus) forages around the Veiled Polypore (Cryptoporus volvatus), feasting on insects attracted to the conk and spreading it in much the same way Porodadalea pini is spread. One can only wonder how many more bird-fungus relationships remain to be discovered. Conner, R. N. and Locke, B. A. (1982) ‘Fungi and Red-cockaded Woodpecker Cavity Trees.’ Wilson Bull, 94(l): 64–70. Jackson, J. A. (1994). Red-cockaded Woodpecker (Dryobates borealis), version 2.0. In The Birds of North America (A. F. Poole and F. B. Gill, Editors). Cornell Lab of Ornithology, Ithaca, NY, USA. Jusino, M. A. et al. (2016) ‘Experimental evidence of a symbiosis between red-cockaded woodpeckers and fungi’, Proceedings of the Royal Society B: Biological Sciences, 283(1827). O’Daniels, S. T. et al. (2018) ‘Visual cues for woodpeckers: Light reflectance of decayed wood varies by decay fungus’, The Wilson Journal of Ornithology, 1301(1). Watson, D. M. and Shaw, D. (2018) ‘Veiled Polypore (Cryptoporus volvatus) as a Foraging Substrate for the White-Headed Woodpecker (Picoides albolarvatus)’, Northwestern Naturalist, 99(1), pp. 58–62. Images courtesy of Martjan Lammertink, and used with his permission. I don’t hear much from this blog, but when I do I am so fascinated by what you post. I loved this, thank you.